In News File Grabber's main window you have an overview of all: Categories and Newsgroups, XPAT search, NZB files, Job queue, Traffic monitor and Web browser! NZB files contain all the information needed for downloading a real "big" usenet article. By using NZB files you eliminate the need of searching manually for all the articles and parts belonging together. You can process an NZB file by importing from your disk, or by downloading from a newsgroup, as well as by downloading the search result from a usenet search engine with the Web-Browser. Usenet search engines - or NZB search engines - are special search engines on the web, which lets you easily search for specific articles on the usenet. Most of them let you download the search results as an NZB file. An NZB file contains all the information a newsreader software needs, to find and to download the desired articles on the Usenet. News File Grabber understands these NZB files, and can process them! PAR2 files are - so called - recovery files. They only will be needed in downloading a "big" usenet-article, if the original set of article files could not be downloaded completely. If the sender of the article also posted a set of PAR2 files for this article, then you mostly will be able to repair the original (incomplete downloaded) set of article files. In News File Grabber's help documentation you will find a description in great detail for repairing incomplete downloaded files! To unpack from downloaded RAR files you do not need an extra piece of software (you do not need WinRAR). A simple click on the button "Unpack/UnRAR..." will unpack the RAR file (or unpack the set of RAR files belonging together)! With the Server Manager you can manage all your usenet servers and usenet accounts, which you want to use to access the usenet. You can add as many as you like (also different accounts from the same server). The servers also can be used for searching for missing article parts. 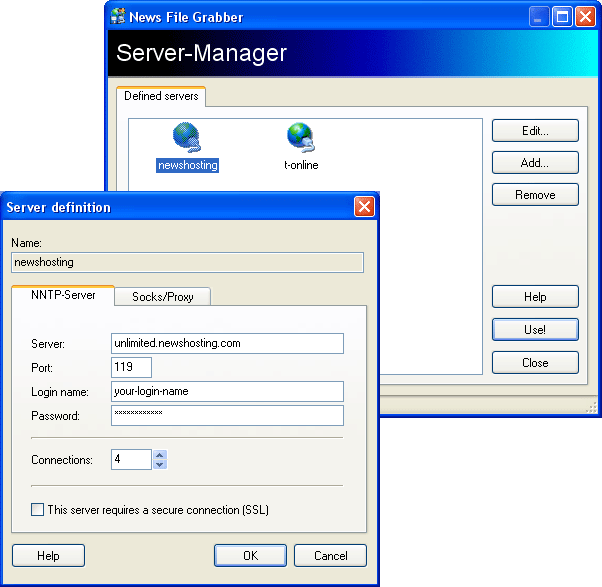 News File Grabber is one of only a few Binaries downloaders for the usenet supporting secure SSL connections! With the new Job Manager you have all your download jobs under control! You can see all running, pending and already finished jobs. You can interrupt and resume jobs as well as cancel or immediately start jobs. The Job-Queue will be saved automatically. With the Newsgroup Manager you can manage your favourite newsgroups, grouping them by categories for a better overview! With the XPAT search you can search for specific articles, either in a single newsgroup or in categories. All software products offered here at rsbr.de are guaranteed free of any form of Spyware and do not contain any Adware!